Why will someone order catering from you, as opposed to any and all options including direct and indirect competition or doing it themselves? That is a very bold question to tackle. Luckily my ADD meds and Columbian coffee are kicking in. I could say it is to avoid embarrassment; you show up on time, leave nothing behind and have plenty of food. A lot of operators think it’s the quality of the food that drives the decision. What about the type of food you offer? I may order catered lunch from my favorite deli, but when I have an Italian themed party, the deli won’t cut it. What about price? Some restaurants compete on price. When a catering decision maker is on a tight budget, they will pick a caterer predominantly on price. Some times they’ll skip a caterer and go straight to a club warehouse and opt for the pre-made sandwich trays, a 55 gallon drum of chips and a 100 liter bottle of soda. What about a personal relationship or connection with the owner or catering salesperson? We all want to do business with those we know, like and trust. What about a company’s branding or impression it gives? Take off your restaurant owner’s hat and play prospect. Drive down the street and take pictures of the restaurants in your trade area. Now go back and analyze them. What do they say? Clean? Dirty? Expensive? Professional? Shoddy? I moved across town almost two months ago. I found a new dry cleaner based solely on their logo and the nice paint job on the building. Every other dry cleaner in this transitional neighborhood looks like they’d make the cut for the next Armageddon movie. My new dry cleaner, Nicholson Cleaners is 1000% better than any of the dry cleaners I’ve used since moving to Nashville in 1992! The staff is friendly. They are very professional. They get it right. Guess what? I have no idea what they charge. It is not important to me. I sign my receipt and don’t pay attention. Linda the owner is my new best friend. One day I went in to drop off my clothes and asked her why they don’t have a drive-thru window; a major convenience. She told me they’ve looked at a thousand configurations, but their property and zoning restrictions prevents it. She told me that if I called from my car, they’d be happy to pick up or deliver my cleaning. “Then why don’t you make that part of doing business Linda?” I asked. I went on to suggest she reserves three or four spots, place large “Curbside Pick-Up” signs with their phone number on them and let everyone know about it. We are now new best friends. She’s in the process of implementing my suggestion and promises me a reward. I don’t care about my reward, just my future convenience. And by the way, since I have a personal relationship and like Linda, her people would have to screw up really badly for me to switch dry cleaners. Do you have that bond with your catering clients? Now what about “WIIFM” playing into catering decisions? That stands for “What’s In It For Me”! Some people will give you a try or use your catering services frequently for rebate certificates or a special bonus they can use. Many of Restaurant Catering Systems’ clients use our Loyalty and Referral System with great success. But let’s be clear, it’s definitely not enough to overcome poor execution. You could say you need to make sure everything I have discussed is 110% in your business. There’s never a silver bullet to building catering sales. Like life itself, you must focus on all of it. It’s a juggling act of sorts, but instill these values in your team and demand nothing but the best. I wanted to share a brainstormed promotion Mike Leake, member and owner of The Wander Inn shared with me during a recent coaching call. Some people call it the “No Peaking” promotion. I call it the “Christmas in January” promotion. During November and December you print up envelopes and stuff them with certificates good for free food and merchandise. It can range from a certificate good for five dollars off your next meal to a t-shirt to a free dessert to a hundred dollar gift card. You’ll want to put very few high dollar prizes and a ton of low dollar prizes like five dollars off your meal in the envelopes. You’ll want to use bright red envelopes and print an explanation of the promotion on the envelope. You will print the prize certificates in very light grey on white paper. The red envelope and light grey certificate make it impossible to hold it up to the light to see what they’ve won. The restaurant promotion requires all of the November and December envelope recipients to come back in to your restaurant in January and get their envelopes opened by a server. We and many of our members get a great return on this promotion. Mike wanted to use it to promote catering in January. He would hand out the envelopes to catering clients around the holidays. The envelopes would have a percentage or dollar discount off their January catering(s). I love the idea of a sweepstakes of sorts to promote catering, but January is the wrong month. You want to sell when people are buying. As a general rule, January is a very slow catering sales month. Were he to make it a January promotion, very few would get redeemed. Even the promise of a large catering discount isn’t enough to cause a client to manufacture an event. So I added this twist. Hand out or mail the envelopes to inactive clients starting in September. It’s not too late to do this, but you’d better hustle. The goal is to get clients from last holiday season and inactive clients to book for the holidays. The envelope would explain that inside the envelope is a prize good for the person ordering catering. It would range from a ten dollar gift card to a hundred dollar gift card. The envelope would be opened at their event or at the time of delivery. Mike wanted to make the minimum prize a twenty dollar gift card. By giving the catering decision maker a personal reward, you increase the odds of former and inactive catering clients using you for the holidays. This is a very simple twist on a great idea. Any and all of the above! Take one from my list and work on it. Once you have one perfected, work on the next. 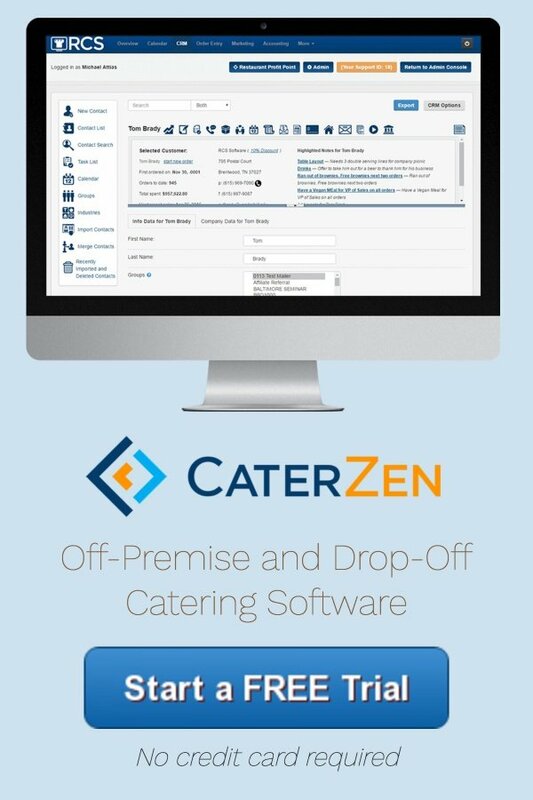 A year from now, you can be dominating your catering marketplace. As a side note to this article, I was on a panel for restaurant owners with a gentleman who had formerly owned a lot of different bars, but is now a restaurant business broker. As a bar owner, he made it a point to meet and get to know three new customers a day. As a business broker, he makes it a point to meet three new restaurant owners a day. 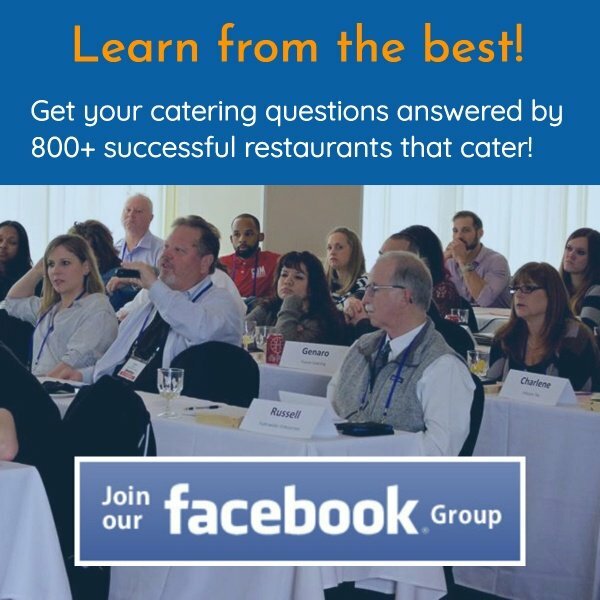 Make it your goal to meet three new catering decision makers a day, and you’ll achieve catering success!